On Tuesday, we headed back across the state to Lovers Key to visit my sister Judy and her husband Dale. They came down from Michigan for a mid-winter break. It was not only great to see them, it also was nice to see the Bonita/Naples area again! 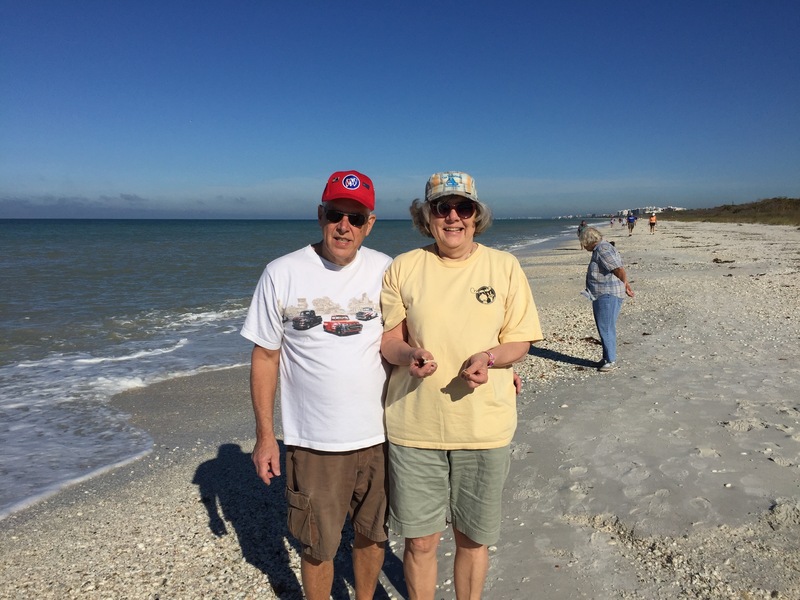 On Wednesday morning, we went for a stroll on Barefoot Beach in Bonita Springs. There were hundreds of intact conch shells. 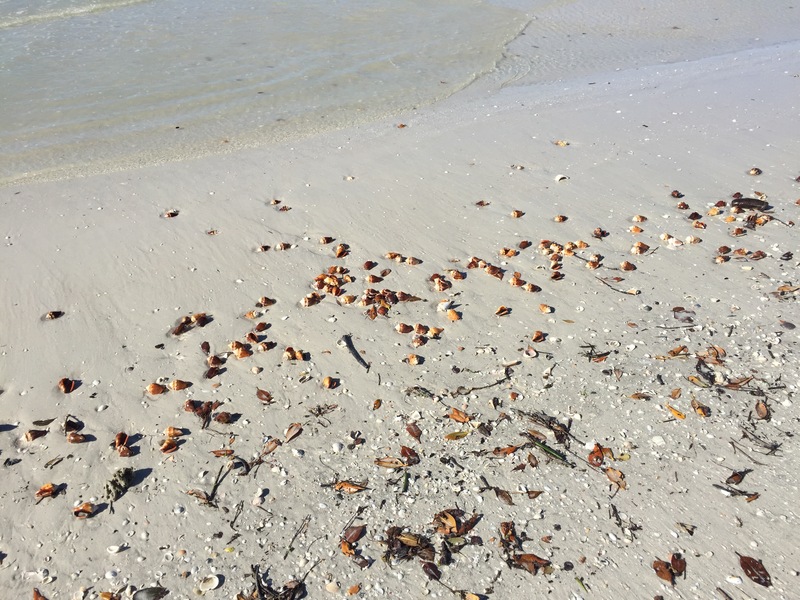 Of all the years we’ve been on Florida beaches, this was the best shelling we had ever seen! 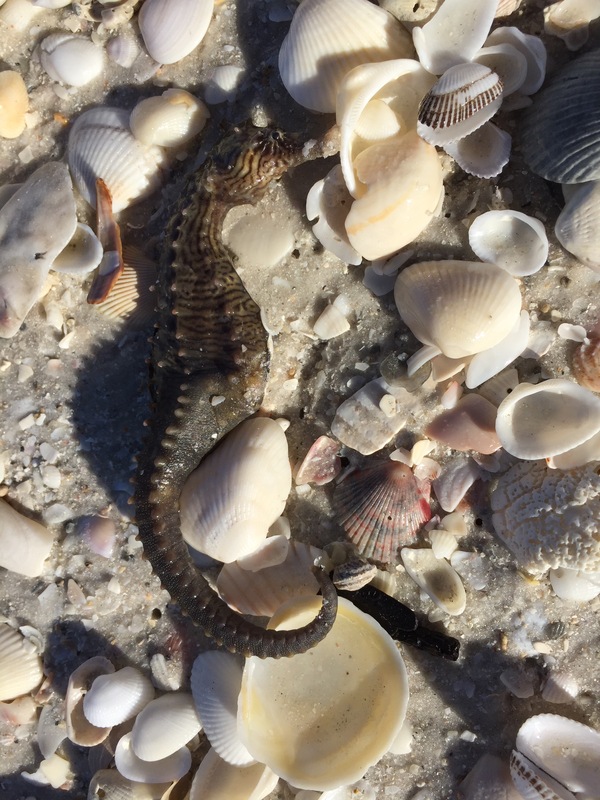 Dale found this sea horse that was still alive, so he took it out into the surf to give it a chance at survival. 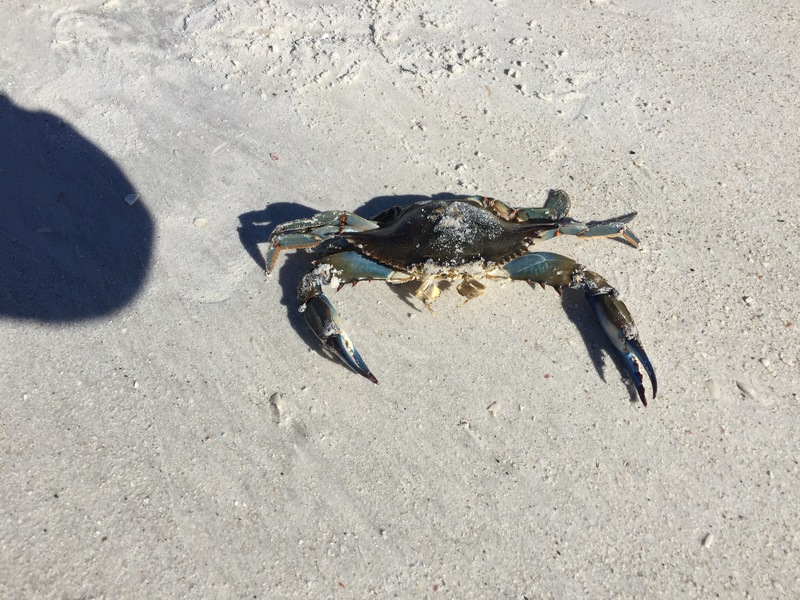 We also saw this dead blue crab. I certainly wouldn’t want one of these grabbing my toe! 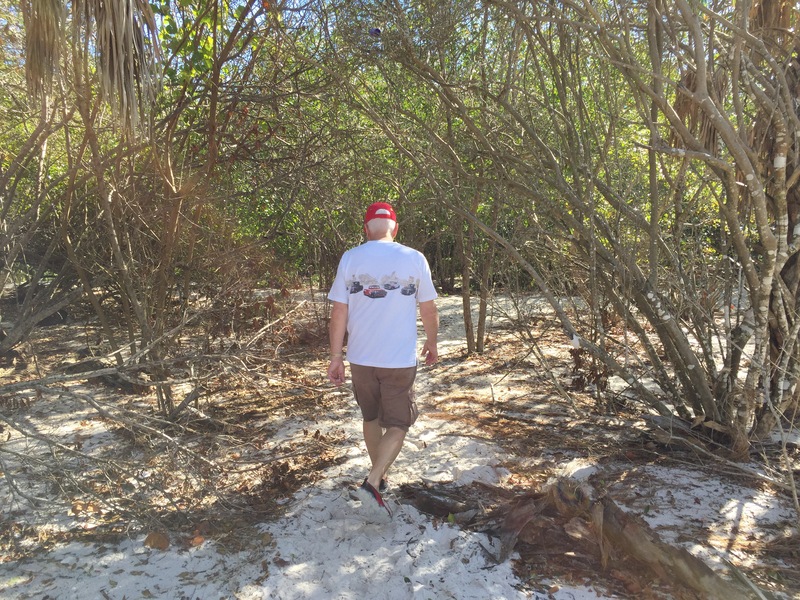 We walked a mile down the beach and returned to the parking lot along a nature path through the mangroves. Afterwards, we returned to their condo and hung out at the pool for the afternoon. We had yet to get any pool time since being down in Florida, so it was a special treat for us. :). Check out the view from their balcony! This is looking south towards Naples. This is looking north towards Fort Myers Beach. We saw dolphins swimming in Estero Bay and even had an osprey fly by with a large fish in its’ talons. 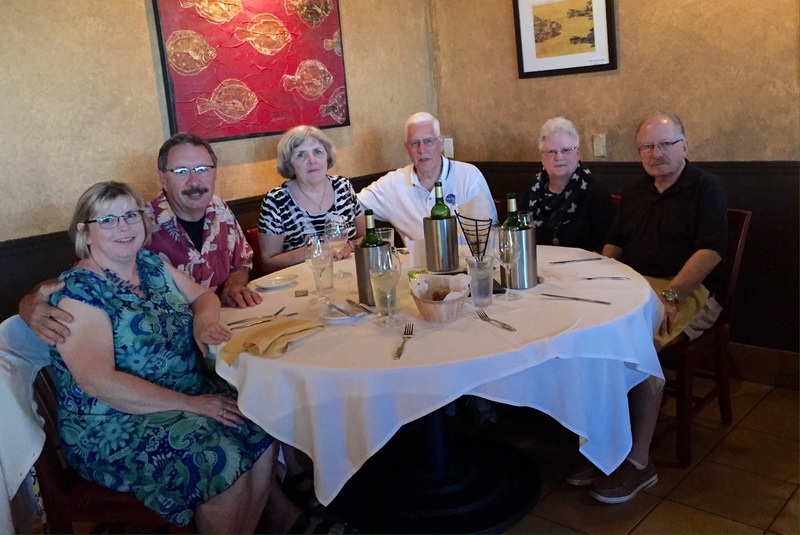 On Wednesday evening, we went to a local restaurant called A Table Apart in Bonita Springs. Dale’s cousin Marilyn and her husband Bill joined us. 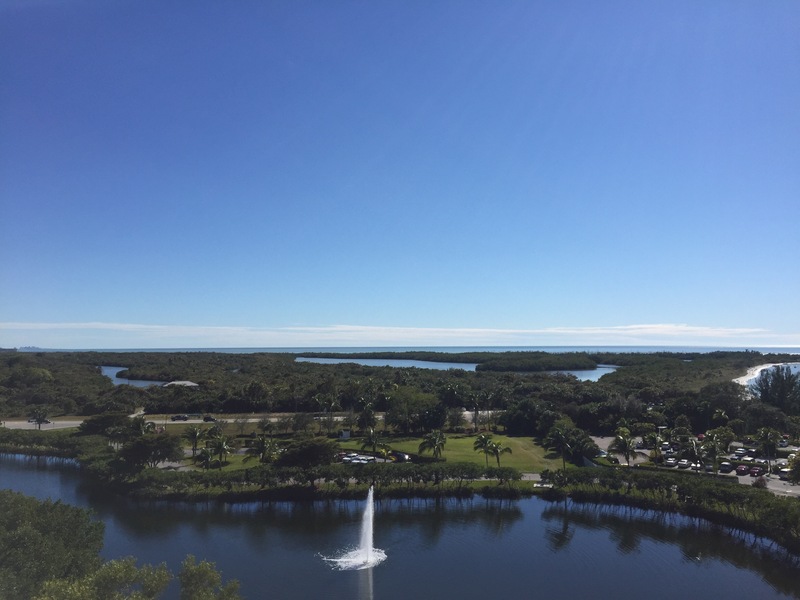 They are also staying for a few weeks at Lovers Key Resort. Aferwards, we caught the tail end of a sunset from Dale and Judy’s balcony. Thursday morning after we headed out, we stopped for breakfast north of Bonita Springs at First Watch. This is a growing national chain of breakfast/lunch restaurants that we first discovered in the Naples area a few years ago. 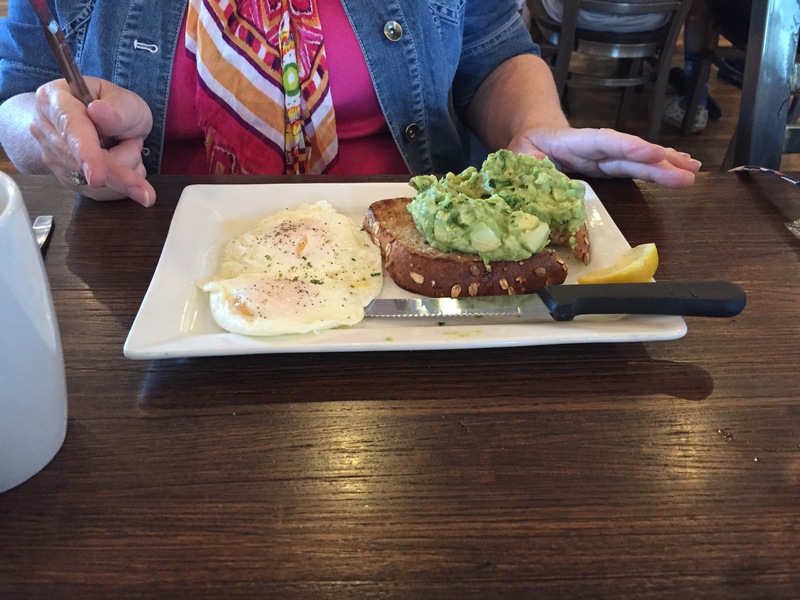 Diana likes avacados, and her breakfast didn’t disappoint! 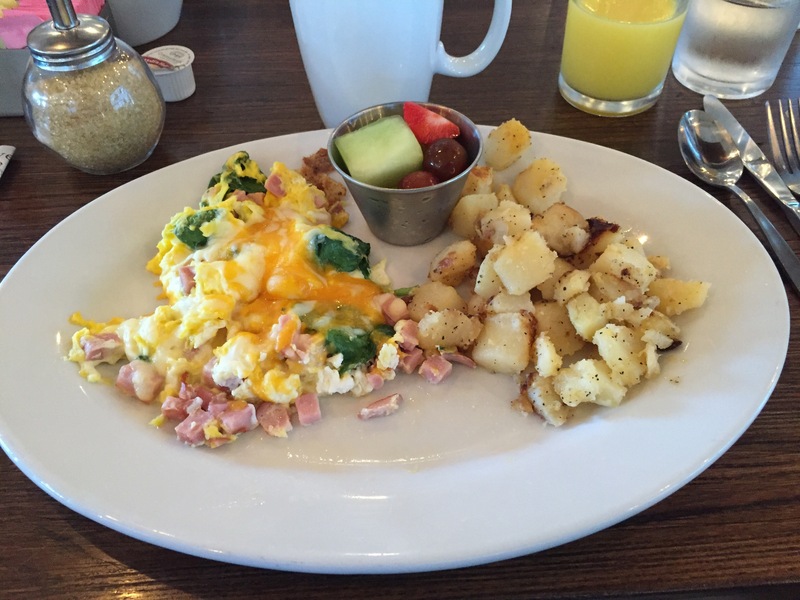 My breakfast scramble was fresh and delicious also! 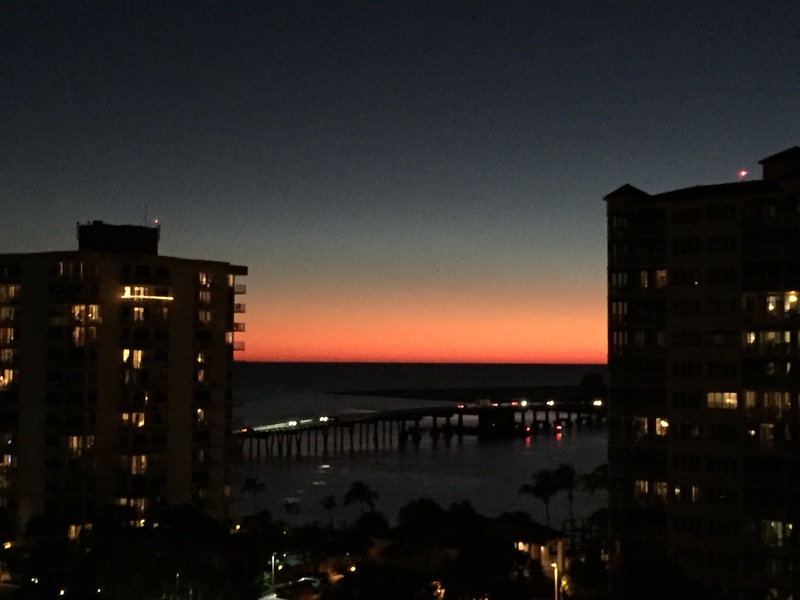 What a nice couple of days in southwest Florida. Thanks, Judy and Dale! The seahorse was a wonderful find! I’ve never seen one washed up on a beach anywhere. Our daughter lived in Naples many years ago and we enjoyed many wonderful breakfasts at First Watch. “Horses, horses, horses” — got all kinds here in Florida! Four legged ones and no legged ones. How fun. Sure hope that horsey made it! Yes, Pam…those are quite the mansions! When they were first developing that area, we thought they were hotels!! Haha! That’s sure what a few look like! What a pretty walk on the beach. So many lovely sea shells. I found some great coral also, Debbie! Those are some beautiful shells. 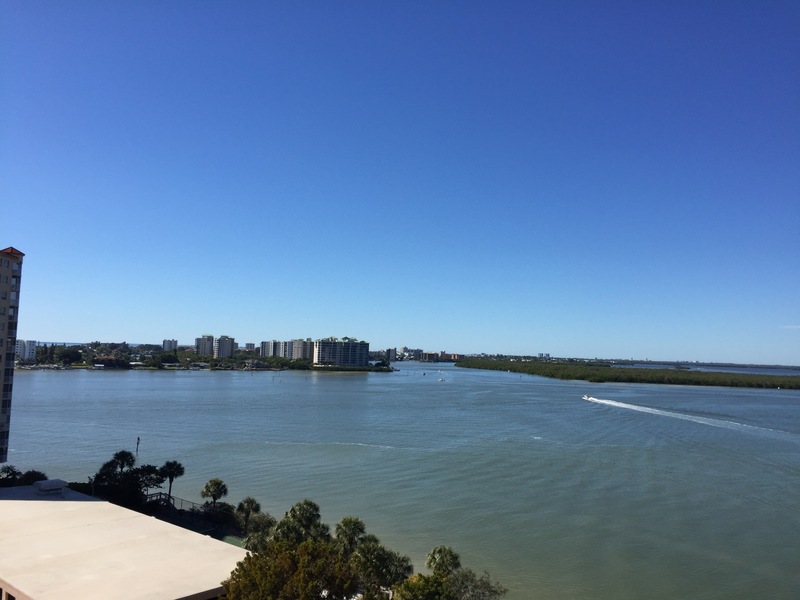 I used to visit Clearwater Beach every winter before we had children and loved walking the beach. Looks like a lovely area. We love the beaches near Clearwater also, Ingrid. Beautiful area! Beautiful! It’s been a very long time since I’ve seen more than a couple shells on a beach. Great fun with family and friends – and superb views of the area from the balcony!! It sure was fun, Jodee! Don’t think we’ve been to that exact area – will check it out one day! LOVE that you found the seahorse alive and put him back! Hope he made it! 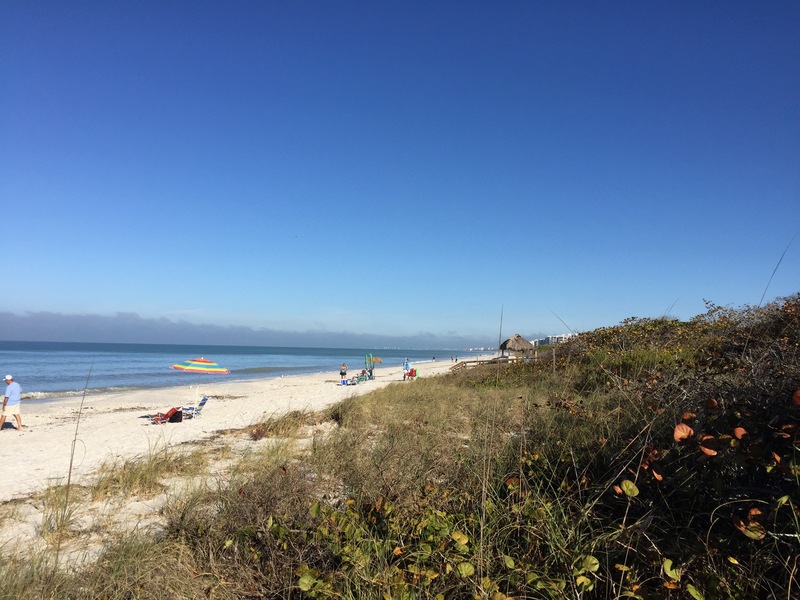 If you haven’t been – try to get to Sanibel and Captiva! Lots of great shells there! Would love a walk along the beach right about now! Great photos of the sea shells and sea horse! Oh it makes sense. I’ve always been to places with big waves (and sometimes rocks). Since you mentioned the Gulf of Mexico, do you think you will be able to spot some whale sharks over there ? Is it common to see them in Florida ?